The Samsung Galaxy Tab 8.9 is probably the thinnest and lightest tablet in its form factor, but now it might have gotten even more alluring for typing enthusiasts as it was premiered with a brand new keyboard dock in Russia. The stylish white chiclet-style full-QWERTY dock has an opening where the tablet slides in at a slight angle for comfortable viewing. Currently, Sammy offers a similar keyboard dock for its 7-inch Galaxy Tab for the price of $79.99 at the Samsung Marketplace and while pricing for the new dock wasn’t mentioned we expect to see a similar price tag. The Galaxy Tab 8.9 went on a tour in Europe with first appeareances in Germany and then Russia. Disappointingly, most initial previews mention some lag in video playback, but we’d attribute that to the pre-release software as the dual-core brains of the tablet are sure to be able to deliver a smooth Honeycomb experience. The new super skinny Galaxy Tab lineup will also bring the latest tablet-optimized version of TouchWiz. 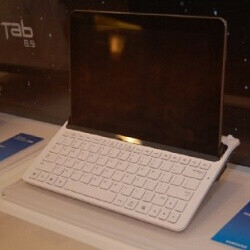 The 10.1-inch sibling of the Tab 8.9 has already shown up stateside for pre-order at J&R. So, while we wait for the official launch, why don’t you check out the video report from the Russian event just below? ASUS EE Pad Transformer is waaaay better than sammy's. Maybe, if it was lighter and a tad smaller. That's why I'm going for the Samsung. I would like a keyboad also but I'm not going to use it all the time and it also needs to be very portable. I might go with the case/bluetooth keyboard.